How well can you answer pet owners' questions about proper diet and feeding? 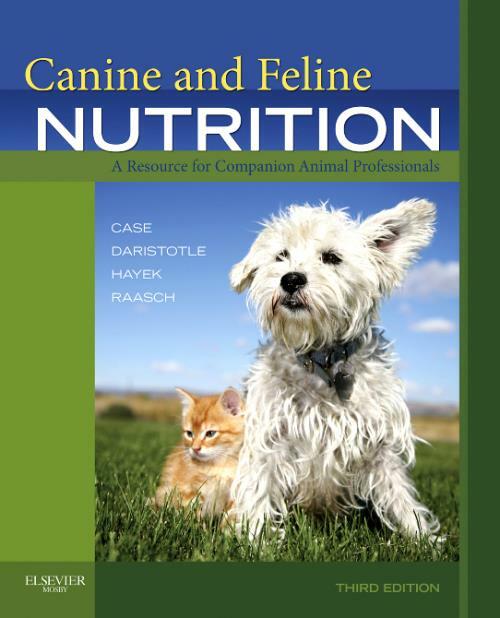 Canine and Feline Nutrition, 3rd Edition describes the role of nutrition and its effect on health and wellness and the dietary management of various disorders of dogs and cats. By using the book's cutting-edge research and clinical nutrition information, you'll be able to make recommendations of appropriate pet food and proper feeding guidelines. Pet nutrition experts Linda P. Case, MS, Leighann Daristotle, DVM, PhD, Michael G. Hayek, PhD, and Melody Foess Raasch, DVM, provide complete, head-to-tail coverage and a broad scope of knowledge, so you can help dog and cat owners make sound nutrition and feeding choices to promote their pets' health to prolong their lives. Case, Linda P. Autumn Gold Consulting, Mahomet, IL; Adjunct Assistant Professor, College of Veterinary Medicine, University of Illinois, Urbana, IL. Daristotle, Leighann Manager, Scientific Communications, Procter & Gamble Pet Care, Lewisburg, OH. Hayek, Michael G. Associate Director, Research and Development, Procter & Gamble Pet Care, Lewisburg, OH. Raasch, Melody Foess Manager, Scientific Communications, Procter & Gamble Pet Care, Mason, OH.